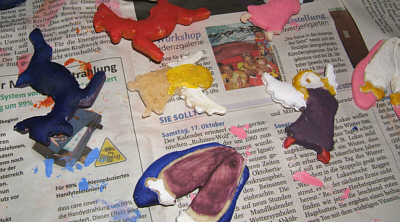 Salt dough is a great modelling clay, which can be prepared quickly and easy at home. What is perfect about it: it is nontoxic and can therefore be used by the little ones at well and you all can enjoy crafty Christmas preparations. The basic dough consists of two parts of flour, one part salt and water. 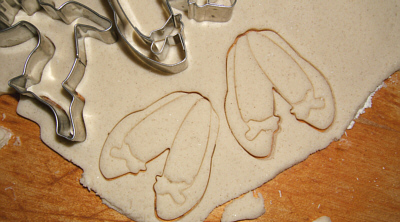 Take your preferred pastry cutters, a pint roll and your are ready to produce lovely Christmas decoration. 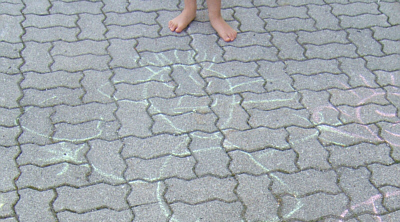 It is easy as pie to mix the dough and you can leave this task to your kids. 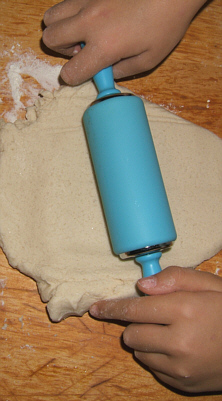 When the dough is ready I would suggest that everyone takes the amount of dough you wish to use, flatten it with the rolling pin (what can be done wonderfully with the blue children's rolling pin). When rolled properly take your cookie cutters and cut out the Christmas tree decoration. 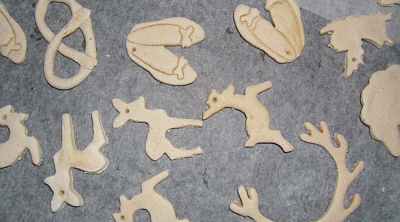 If you like you can directly cut out the tree decorations directly at the baking tray, so you don't have to move the dough when it is cut out. If the dough in the bowl gets to try while your are cutting or modelling, you can always add some water and mix it again. Don't forget: the tree decorations need little holes where you can put in some string to hang them later on - use e.g. a small knitting needle to make this hole. But the baking tray into the oven at 85 degrees Celsius. Leave them in half an hour for every 0.5cm - if your tree decorations are 1cm in height leave them in the oven for an hour. The salt dough is ready, when the objects are dry and sound as if they where hollow. Take the tray out of the oven and let the salt figurines cool. You can paint them now or just cover them with varnish. Use a thin string, put it into the hole - and your tree decoration is finished, you can use them as gift tags as well or give them as present, these wonderfully handmade Christmas Decorations. Have fun mixing, cutting, baking and decorating!